Whether it is a question of a romantic trip on a gondoletta boat or a visit to the citrus garden, the herbaceous garden, the iris garden or the garden of medicinal plants; whether it is about spending time at the park’s summer festivals or at the KlangOase, where one can listen to ethereal tones in the outdoors – the Luisenpark provides relaxation, culture and nature. Visitors can enjoy strolls along curving paths and replenish their energies on the sweeping lawns. The Chinese garden provides a realm of enchantment all of its own: the Chinese tea house radiates a special individual power. Weight and lightness create an energy-giving alliance here. The peonies in May are one of the many floral highlights, creating aesthetic fireworks in shades of yellow, white, pink and red. 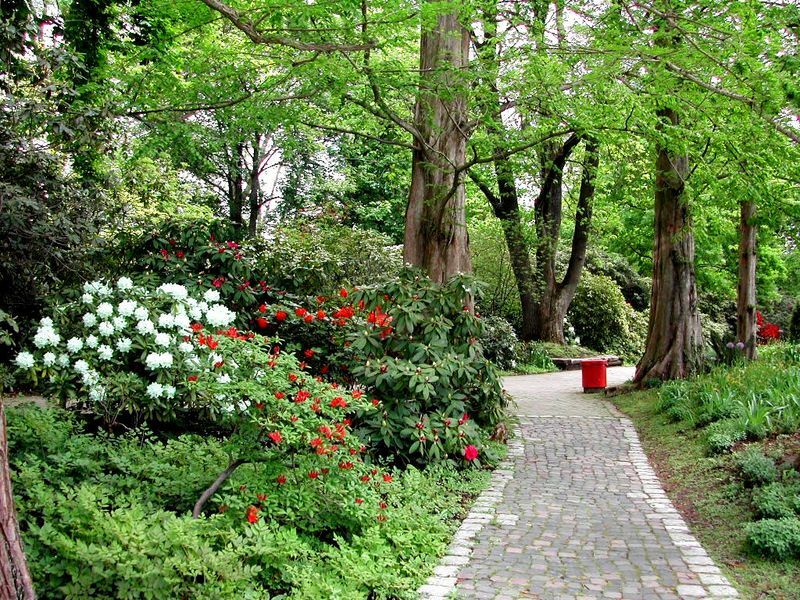 Created between 1892 and 1894 by the Siesmayer brothers from Frankfurt and named after Grand Duchess Luise of Baden, the Luisenpark soon became one of Mannheim’s most popular green spaces. The park was developed further for the Federal Garden Show in 1975. In spring, the Luisenpark is a particularly splendid sight: over 300,000 spring flowers welcome visitors every year in newly created borders. In summer, colourful floral arrangements adorn the flowerbeds, which are re-planted on a regular basis. More than 50 different kinds of daylilies alone can be seen in the Luisenpark. A visit to the park in autumn is also worthwhile: the herbaceous garden with its hundreds of flowering asters around the free-standing bronze sculptures is perfect for relaxation. Geometrically planted trees and hedges provide the structure of this idyllic semicircle while innumerable species of perennials radiate their playful charm from late summer onwards. Autumns asters, coneflowers and anemones celebrate with a huge festival of blossoms. 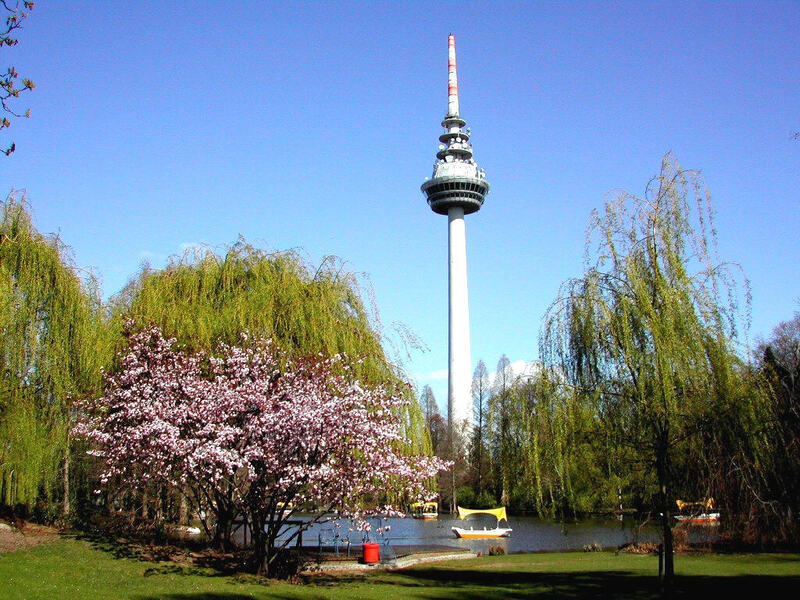 A particularly noteworthy oasis of calm can be found at the foot of the telecommunications tower – theKlangOase. Sounds which were composed especially for the park can be heard from six sources hidden in the surrounding trees. The heather garden comes into flower in the cooler season. Various heathers located directly at the edge of the Kutzerweiher pond bring bright colours into the park. The first species of winter heath and winter-flowering heather start to bloom as early as November. Their flowering period extends to mid-May. Grey heathers with dozens of variations in colour take over for the period from early summer to late autumn. A wonderful spot for the “orchid of the north” has been created in the iris garden. Irises find ideal conditions at the edge of the Gebirgsbach stream in a landscape enhanced by small boulders and low hills. They range from the crystal-white “Alizee” to the deep red “Vamp”. A stroll along Heinrich-Vetter-Weg is ideal for those interested in art: outdoor sculptures and figures form an aesthetic alliance with nature here. The Mediterranean citrus garden, which was created in 2001, is also one of the highlights of a visit to the park. More than 150 plants from southern realms can be found here. Apart from limes, mandarins and clementines, there are bergamots, Seville oranges, satsumas, calamondins and citranges. A romantic gazebo, benches, pedestals and the mighty natural stone walls of yellow tuff radiate a Mediterranean atmosphere. The garden of medicinal plants has a veritable community of fans. Over 180 different types of plants show that nature in Mannheim provides “a remedy for almost every ailment”. Visitors can observe hundreds of species of colourful butterflies in the plant display house, allow themselves to be taken on a journey to the depths of the oceans by the colours of the underwater world and go on a safari in the tropical and subtropical buildings. A path in the great hall takes visitors past coffee trees and mighty gum trees, past a traveller’s tree and a giant bamboo. The stalks of the bamboo grow up to 35 centimetres on favourable days. The small plant hall displays tropical crops such as papayas, guavas, coconut palms and date palms as well as crotons, dracaena trees, pandanus trees, pothos, rubber trees and many more. The colourful orchids in this hall are particularly eye-catching. It has been possible to admire more than 50 different types of fern in the tree fern house since 2005. The “journey through the ancient past” to living fossils takes visitors along a path lined by maple trees and conifers and past various – in some cases very rare – species, starting with A as in athyrium filix femina, progressing to F as in frizelliae (“lady’s fern ‘frizelliae’) and continuing as far as W as in woodsia. Enjoyment of quiet moments or playful exploration of the environment – both are possible in the area around the Gebirgsbach. While young adventurers capture the two “jungle bridges”, those seeking peace and quiet find a perfect place of retreat at the upper part of the stream in a romantic setting amongst willows, alders and marsh plants. Every hour, about 50 cubic metres of water flow from the Gebirgsbachinto the Kutzerweiher. The water is then pumped back up again. The Kutzerweiher is home to ducks, herons and flamingos and is one of the “senior gentlemen” of the park. The pond was created back in the 1920s and was named after Theodor Kutzer, who was Lord Mayor of Mannheim at that time. A realm of enchantment all of its own opens up at the east end of the Luisenpark: the Chinese Garden. The elaborately designed garden dating from 2001 contains a faithful reproduction of a Chinese teahouse and radiates a special individual power. Everything here is “in flow” in the truest sense of the word: peace and strength, weight and lightness. Garden and landscape architect Professor Li Zheng was particularly concerned about the harmony of seven things when creating the garden – earth, sky, stones, water, buildings, paths and plants were to harmonize with each other. The floral highlights here are provided by bamboo, reeds and brightly-coloured peonies which generate colourful fireworks in shades of yellow, white, pink and red annually in May. The peony collection in the Luisenpark is the second largest in Germany. For additional information see website. Cultural Programme and Exhibitions: Visit website: www.luisenpark.de. A map for download here: www.luisenpark.de/mein-luisenpark/parkbesuch/parkplan. For children: Playgrounds and other activities, „Green School”, Tel: 0621-41005-0. Access for people with disabilities: All main paths are fully accessible. Wheelchairs (free) for rent.